Rumor has it that I'm "on assignment" to write a cross-country skiing and snowshoeing book for the Lake George, NY area this winter. 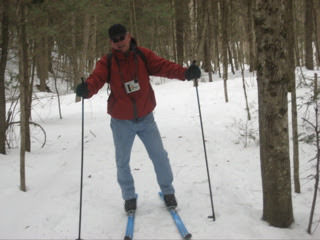 Well, here I am on January 31st, 2008 at the Pack Demonstration Forest near Warrensburg, NY. But, I'll be in Florida on February 5th to lead a free Eco-tour for all my friends down there. Check my Events calendar on my webpage for details. 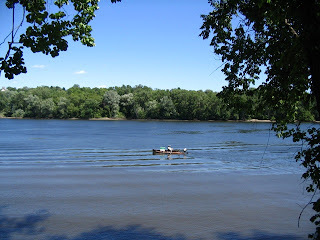 We took this photo a few days ago as we came off a little-known trail near Glens Falls, NY. The area we were at is closed during the winter months, but we investigated and found the man in charge of the facility. After a nice conversation he made it clear that the area is closed for everything else, but it is open for cross country skiing and snowshoeing any time there is enough snow. So this little known area will be included in our upcoming book on cross country skiing in the Lake George area. In the meantime, we've got a lot of skiing, snowshoeing and exploring to do. It's a dirty job, but somebody has to do it. Okay, let's make the new year of 2008 just as much fun for all of us. Best wishes to all.